The purpose of this guide is to provide resources and information to the UMass Medical School community about open access and new models of scholarly publishing. "Open access" is free, unrestricted, online access to scientific and scholarly research. There are two primary vehicles for providing open access: open access journals, and open access archives or repositories, such as eScholarship@UMMS. The purpose of this guide is to provide resources and information to the UMass Medical School community about open access and new models of scholarly publishing. "Open Access Explained," an 8-minute fun and engaging animated video from PHD Comics. 1. Publish in open access journals. See the Evaluating Open Access Journals page of this guide for more information and a list of Publishing Opportunities. Peter Suber has written a detailed post on this topic called "How to Make Your Own Work Open Access" for the Harvard Open Access Project. 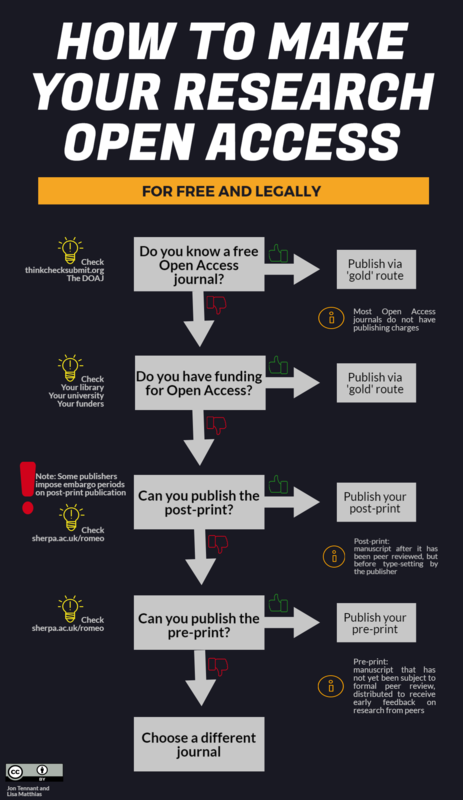 Researcher Jonathan Eisen's list of "10 things you can do to REALLY support open access"
Ross Mounce's "Easy Steps towards Open Scholarship"
This infographic shows how researchers can make their work publicly available, free and legally. 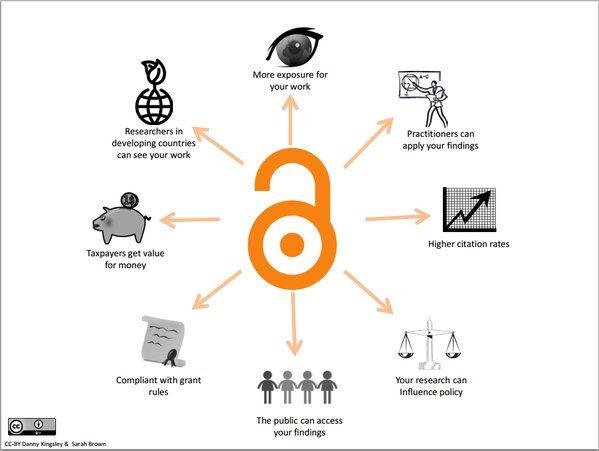 Matthias, Lisa; Tennant, Jon (2018): How to make your research open access? For free and legally.. figshare. Fileset. https://doi.org/10.6084/m9.figshare.5285512.v3. Licensed under https://creativecommons.org/licenses/by/4.0/. - Better visibility and higher impact for scholarship. Research has shown that articles available freely online are more often cited and have greater impact than those not freely available. - More knowledge leads to better patient outcomes. Opening access to research will allow all doctors access to relevant information for decision making, leading to more effective treatments and better outcomes. Access to medical research is also crucial for patients and patient advocates. - Return on the public's investment in taxpayer-funded research. Open access allows the public to see the results of that investment. - To help achieve science's full potential by removing price barriers. With open access, researchers worldwide can read and build on the findings of others without restriction. - Improved education. Faculty and students will not be limited by the selection of scholarly journals their campus libraries are able to provide. Scan this September 2015 Twitter conversation about why we need open access ... "raise your hand if you've ever wanted to read an article you couldn't access." "Gold" Open Access: Publishing a scholarly article in a peer-reviewed journal with open access, sometimes financed through article publication charges. "Hybrid" Open Access: An option now offered by many traditional publishers where an author can pay a publication fee to make an article open access. Post-print: Author-created final version after peer review, also known as the "accepted manuscript". This is the version mandated in the NIH public access policy and in most institutional open access mandates. See also the VERSIONS Toolkit, which has practical advice for academic researchers as authors.